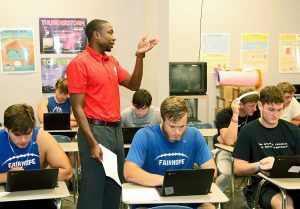 DAPHNE, Ala. – United States Sports Academy faculty recently provided concussion prevention education to football players at Fairhope (Ala.) High School through a program designed to address the growing issue of sport-related concussion among young athletes. USA is currently seeking a $1.6 million grant from the Centers for Disease Control (CDC) to build on the progress already made by CAP by expanding the program to a wider geographical area, as well as serve younger athletes. The Academy would provide the educational component of the concussion prevention program as a sub-recipient of the grant.